If you live and breathe good food and great drinks Long Lunch Tours are the company for you to book your next trip with. Covering the quality hospitality of the region from Karnup to Serpentine to the Bickley Valley and everywhere in between, your experienced local guides will take you to the hidden gems of the region and well-known local favourites. In the process you’ll try the best beers, ciders, wines and food the region has to offer and learn everything you wanted to know about the food culture of our region. 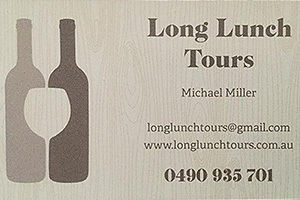 As all venues on the tour require advanced notice it is recommended to get in touch with Long Lunch Tours more than 2 weeks in advance of your preferred date.